Preconceptions and Emerging Issues of Control and Aging. Preconceptions of Vulnerability and Control in Old Age: A Critical Reconstruction (P.S. Fry). Life-Span Development and Controllability. Controllability and Adaptive Coping in the Elderly: An Adult Developmental Perspective (F. Blanchard-Fields). Autonomy, Despair, and Generativity in Erikson's Theory (J.A. Meacham). Action-Theoretical Approaches to the Development of Control Orientations in the Aged (F.E. Heil, G. Krampen). Person-Environment Fit and Interaction Model of Control and Coping. Person-Environment Transactions Relevant to Control and Helplessness in Institutional Settings (E. Kahana, B. Kahana, K. Riley). Situational Perceptions of Control in the Aged (V.L. Fitch, L.R. Slivinske). Control and Dependency in Residential Care Settings for the Elderly: Perspectives on Intervention (P.A. Munson). Cognitive Social Learning Theory of Control and Aging, Participatory Control and the Well-Being of Elderly Persons (D.R. Reid, G. Stirling). Reconstructions of Control. Loss of Control among the Aging? : A Critical Reconstruction (M. Gergen). The Implications of Gender and Speech for the Experience of Control in Aging (A. Harris, N. Miller). Psychosocial Antecedents and Sociological Perspectives of Control and Aging. Power, Control and Well-Being of the Elderly: A Critical Reconstruction (P.S. Fry, L.R. Slivinske, V.L. Fitch). Enhancing Memory by Modifying Control Beliefs, Attributions, and Performance Goals in the Elderly (E. Elliott, M.E. Lachman). Creating Psychological and Societal Dependency in Old Age (J. Hendricks, C. Leedham). Choosing to Improve Performance (L.C. Perlmuter et al.). 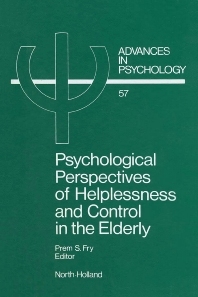 Psychological Perspectives of Helplessness and Control in the Elderly: Overview and Appraisal (P.S. Fry). Indexes. The past few years have witnessed widespread acceptance of the notion that few elderly individuals are willing to stand by silently in the process of growing, and to relinquish whatever actual controls, autonomy or control beliefs they had in the past. Increasingly, old age is viewed as the dynamics of growth in mastery, control and self-efficacy, on the one hand, and a relative decline in psychological and physical resources on the other. It is the intent of this volume to communicate both aspects of these changes, and to offer a comprehensive review of the cross-fertilization of the field of gerontology and the psychology of reactance, freedom and control. Leading psychologists and social science researchers from the United States, Canada and Europe give their views on the meaning and application of control-related constructs having specific implications for the field of human aging. They address themselves to one or more of the major themes, issues or concerns which currently figure in discussions of control beliefs and control constructs as they apply to aging and old age. Written primarily for scholars, researchers and developmental theorists interested in the complexities and generativity of control constructs and their applications for the psychological well-being of older adults, the data and issues presented will be equally informative to gero-psychologists and mental health professionals concerned with healthy adaptive functioning of the elderly.